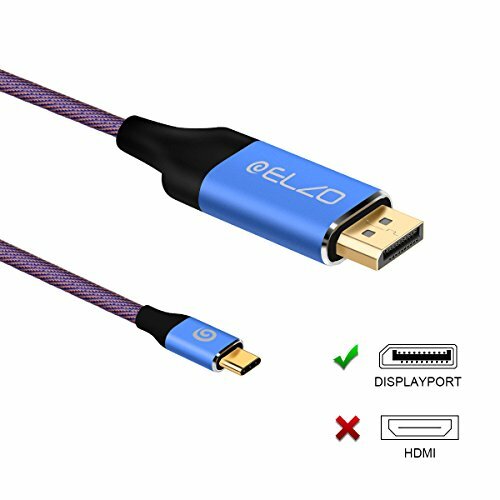 Why Choosing Elzo USB C to DisplayPort Cable? Elzo USB Type-C to DisplayPort Cable is specifically designed to connect the new release computers with a USB-C or Thunderbolt 3 connector to existing display monitors with DisplayPort. Experience the vibrant video and authentic audio supported by monitors with DisplayPort for gaming, video streaming, or a multiple monitor workstation. Thunderbolt 3 equipped devices now use the slim, reversible USB-C connector. Compatible computers or smartphones with a USB-C or Thunderbolt 3 port can use this cable. 1. Do not support other USB-C Phones (except Samsung Galaxy S8/S8+ ) or tablets except compatible devices list(google, LG, G5, G6). 2. Please note that resolution and refresh rate also depend on your host devices and external display. 3. It will take 8 to 10 seconds to perform data synchronizations from USB-C devices to DP-equipped monitor. 4. In order to protect the equipment, please reduce hot plug and pull. 5. Not recommended for use lenovo dell XPS 13, yoga 910/9310, hewlett-packard spectre X360, because the video or audio signal is unstable. High Performance: Supports video resolution up to 4K 3840*2160p at a stunning 60 frames per second refresh. Monitor and Projector without blur or lag. Backward compatible with 1080p and 720p. Simple Plug & Play: Just simple connect the USB-C port on smartphones/computer directly to displayport on projector/display via DP cable to enjoy the widescreen for games, movies and presentation. No adapter or driver/software required. Wide Compatibility: Compatible with 2017/2016 MacBook Pro, 2017 iMac, Dell XPS 15 / XPS 13, Surface Book 2, Pixelbook, Acer Switch Alpha 12, Lenovo Yoga 920/910/720, HP Spectre X360, HP Elite X2, Razer Blade, Intel NUC Skull Canyon, and many others. Durable Design: Braided nylon cable with gold-plated end is easier to reach TV from USB C devices providing vibrant details superbly without any signal loss from the source. If you have any questions about this product by ELZO, contact us by completing and submitting the form below. If you are looking for a specif part number, please include it with your message.